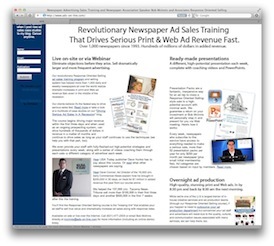 Driving Serious Newspaper Ad Sales: Is it time to fire your ad staff and start over? Is it time to fire your ad staff and start over? Newspaper publishers and advertising directors across the country are stumped as to why so many of their legacy ad reps are still having trouble making the jump to selling digital. Selling digital is not that complicated, is it? Is it a coincidence that many of those same ad reps are having major trouble selling print, too? As print ad revenue continues to decline, it's all too easy to miss the relationship between the two problems. As managers, we're quick to explain away print revenue losses as simply what happens as readers and advertisers migrate to digital. We cut the ad rep a little slack, and let him keep doing what he's doing. Of course, the cause of and the solution to both problems are really the same: we've hired, kept, and rewarded the ad reps who brought in revenue for us, no matter how they did it. When I was an ad director, I was certainly guilty of this. My reps had different ways of getting the job done. Although I encouraged them to approach the sale the way I had taught them, some on my team thought they knew better and did their own thing. They relied on sheer enthusiasm, persistence, aggressiveness or outdated sales techniques. They took shortcuts and focused on selling the media instead of getting the advertiser a response. They made poor recommendations that weren't in the best interests of the advertiser. They left money on the table. But as long as they were hitting their goals, I could justify looking the other way. I always had bigger problems to deal with: new ad reps to train, empty territories to fill, and pressure to make my own departmental goals. I know I'm not alone. I've seen countless publishers and ad directors cringe as they watch some of their ad reps sell. But as long as ad reps are making their numbers, it's easy to look the other way. Until they're not hitting their goals anymore. With increasingly attractive and less expensive options available, the chances of prospective advertisers choosing to spend money with your newspaper is at an all-time low. The marketplace that forgave less than optimal sales behavior is gone. We're discovering that even a salesperson who once made their numbers may not be such a great salesperson after all. And just as we can't blame the decline in ad revenue just on digital, we also can't look to digital as the only solution. In order to survive and thrive in this increasingly competitive environment, ad reps need to be executing perfect sales calls every time. There's simply no margin for error anymore. Many ad reps believe it's as much their right to choose their style of selling as it is to choose what color car they drive, what kind of music they listen to, or their political beliefs. They'll defend it just as passionately. Sure, everyone has their own personality, but there's a precise selling process they should be following on every call if they have any hope of thriving as a print and digital ad rep in today's market. Teach them the right way to sell. If you teach them how to be strategists for the prospective advertiser, it won't matter what product they eventually recommend. The techniques need to be sound and the training program needs to sell them on the fact that there's a better approach to the sale. Case studies help a lot. I actually wrote a 25-page free e-book about exactly what goes into a successful training program (and we practice what we preach). You may not have hired some of them for their analytical skills, so they're going to need some major coaching, which should include help identifying where the money is and step-by-step hand-holding through the sales process. You'll probably need to help them build the presentations (we do all that, too). Test them. Make them prove to you that they have it down. And make sure they know you'll be testing them periodically. Because we all get distracted easily with more pressing things, have them show you that they approached the sale properly on a weekly basis. No matter what you say, some of your ad reps won't believe that the approaches they've been using so successfully for years is now the problem. They'll blame it on tough times. Others might not be motivated enough to change or just afraid to change. Fire them before they bring your newspaper down and get somebody in there that'll do the right thing for your advertisers. Want to make sure your new ad reps succeed with print and digital? Make sure they're analytical. They need to be able to properly analyze a business, its competitors, and target customers and put together a strategy to drive business to them. It's these strategies that will set your publication apart and it's something your competitors, (including many digital and social media experts), aren't doing. Teach your existing staff the right techniques or hire new sales reps that gravitate to analyzing businesses and they'll be able to sell all your products and services, print and digital combined. 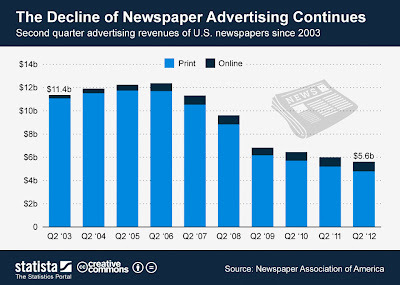 In short, don't be so fast to write off your publication's print revenue decline to digital. You work hard to create a fantastic publication. Insist your ad reps are doing their part flawlessly, too, or what they're hearing about print being dead might just come true. I hope this helps. Leave a comment sharing your thoughts below (including how much you disagree with me). Share this post with your friends. And subscribe to my Twitter feed and check out my Facebook page for other interesting resources.